First Brexit, Now This: Iceland Bounces England From Euro 2016 Tourney : The Two-Way "This is done! This is done! We are never going home!" a commentator on Icelandic TV said. He added, "Live the way you want England. ... You can go home! You can go out of Europe! 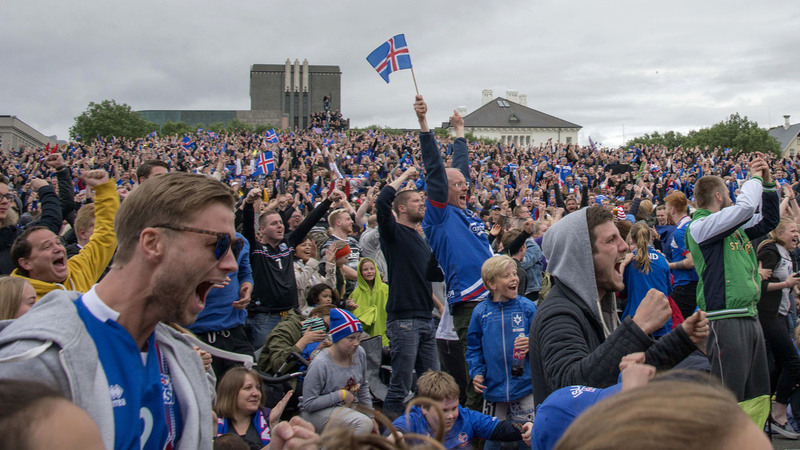 Iceland's victory in the UEFA Euro 2016's Round of 16 set off celebrations in Reykjavik. Another day, another surprising result for the English to digest: Iceland pulled off a historic upset in the Euro 2016 tournament Monday, sending England home with a 2-1 shocker. Iceland now becomes the smallest nation to reach the quarterfinals of the UEFA European Championship; next, it will face the host France in Paris. As the clock expired in regular time, Iceland's blue-clad players streaked across the turf to stand before their ecstatic fans. Video posted on Twitter and elsewhere shows that the scene was a disparate one, with Iceland's teams and fans clapping their arms over their heads in unison — while roaring boos emanated from England's fans who clearly were displeased to be on the wrong side of a historic result. The match becomes "the worst defeat in our history," BBC Sport's Gary Lineker tweeted. He added, "England beaten by a country with more volcanoes than professional footballers. Well played Iceland." After leaping out to a 1-0 lead with an early penalty-kick goal from Wayne Rooney, England watched Iceland almost immediately tie the score on the strength of a long throw-in — and then saw its opponent seize a 2-1 lead that Iceland would never relinquish. England mounted dangerous attacks and dominated possession, 63 to 37 percent. But Iceland had defensive cohesion and, as an underdog, relatively little pressure. It also had Ragnar Sigurdsson, a center back who plays professionally in Russia and who made several crucial plays after scoring his team's first goal Monday. "They thought this would be a walk in the park," said Sigurdsson, who was named man of the match. "They started very well and with great power, but they were shocked by the equalizer and the 2-1 goal. They panicked, though they're a good team. As you know, it's difficult to score goals against Iceland." While its current run is without precedent, Iceland has been building toward this moment for some time. By January, it had climbed more than 100 spots on FIFA's global rankings; it qualified for this tournament by beating both the Netherlands and Turkey, and it recently played Portugal to a draw. Those successes help explain why more than 8 percent of Iceland's population decided to come watch its team play in France. Monday's match brought a passionate response from an Icelandic TV commentator who yelled in disbelief as time expired, "This is done! This is done! We are never going home!" To the opponents, he said, "Live the way you want England," later adding, "You can go home! You can go out of Europe! You can go wherever the hell you want!" In terms of land area, England isn't that much bigger than Iceland, with more than 50,000 square miles compared with nearly 40,000 for Iceland. But the two are far apart in terms of population, with England having some 54 million people (in 2013 figures) to Iceland's 331,000. As if the scenario needed any other parallels with last week's vote in which Britain chose to leave the European Union, England's coach, Roy Hodgson, announced his resignation after the upset loss, similar to David Cameron announcing he would abandon the prime minister's office. "I am extremely disappointed about tonight's result and ultimately our exit," Hodgson said, according to UEFA's aftermatch report. "We haven't progressed as far as I'd thought we were capable of and ultimately it is not acceptable."